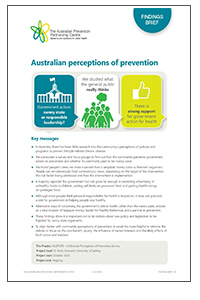 Perceptions of prevention: what does the Australian community think? Click on the image to read the Findings Brief. There is debate currently about what role the government should play in regulation for preventive health. Some commentators view government regulation and health promotion activities as constituting a ‘nanny state’ that is overly controlling of individual choice and freedom regarding their health. Determining the right balance of government intervention and personal choice is a challenging issue for complex problems such as the prevention of lifestyle-related chronic disease. Therefore, gaining a better understanding of community awareness, attitudes and values regarding chronic disease prevention policies and programs is key to optimising communication and formulation of public health action. Decisions regarding various policy options for prevention may gain or lose momentum depending on policymakers’ perceptions of how the policy may be received by the general public. Health promotion advocates argue that the current anti-intervention narrative discourages government from committing to the more effective systemic changes needed to effect population level change. In Australia, there has been little research conducted to better understand community knowledge and attitudes regarding people’s understanding of prevention and of policies and programs to improve lifestyle-related chronic disease. In 2016 we conducted a national population survey to quantify community attitudes and values towards government intervention and development of policies and programs for the prevention of lifestyle-related chronic diseases (AUSPOPS). Formative research using focus groups were conducted to inform survey development. Exploring and measuring community perceptions of prevention through primary research will assist policymakers gain a more direct indicator of community attitudes and the logic which underpins them. The research is expected to show how the Australian community views government intervention for the purpose of health prevention, and how these perceptions may vary over demographic and health-related factors. Work has started on a second AUSPOPs survey based on findings from the first survey. Preliminary findings were presented at the World Public Congress on Public Health, Melbourne, April 2017.